All the photos from this trip can be found in Photo Lines here. 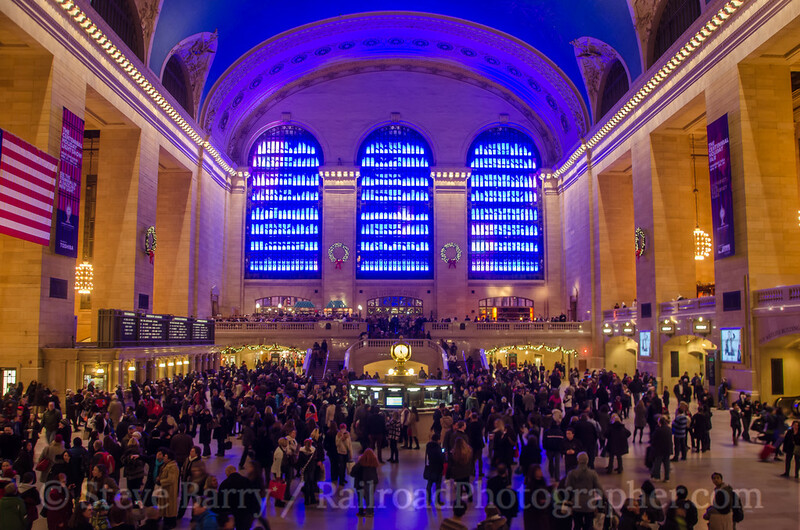 I've been traveling into Grand Central Terminal in New York a lot this year -- after all, this is the building's centennial year. 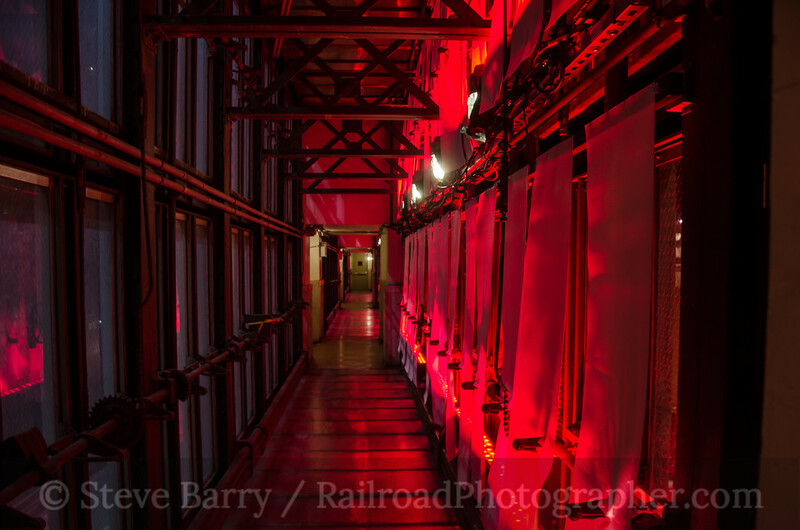 I've been there to shoot exterior night shots, there for the centennial on February 1, back for the Parade of Trains in May, and probably another couple of trips. So it's only fitting as the year winds down I headed back into GCT for the final big event of the year -- the Centennial Holiday Light Show. Naturally the best way to get into GCT is by train, and I picked a place to leave my car that was both convenient and provided a photo angle I had not tried before. 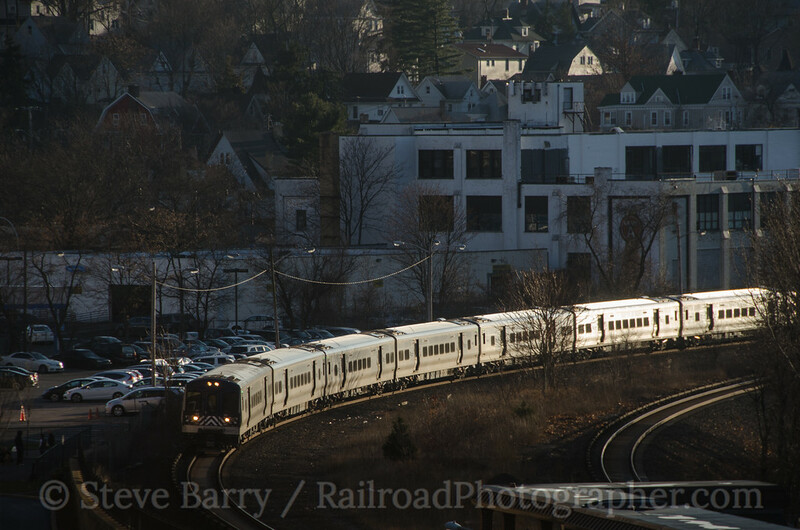 So, after leaving my car on the fifth floor of the parking garage at White Plains, N.Y., I headed up to the eighth floor to shoot a northbound set of Metro North M3s in the low afternoon sun. After shooting this I headed down to the platform to catch a southbound into the city. 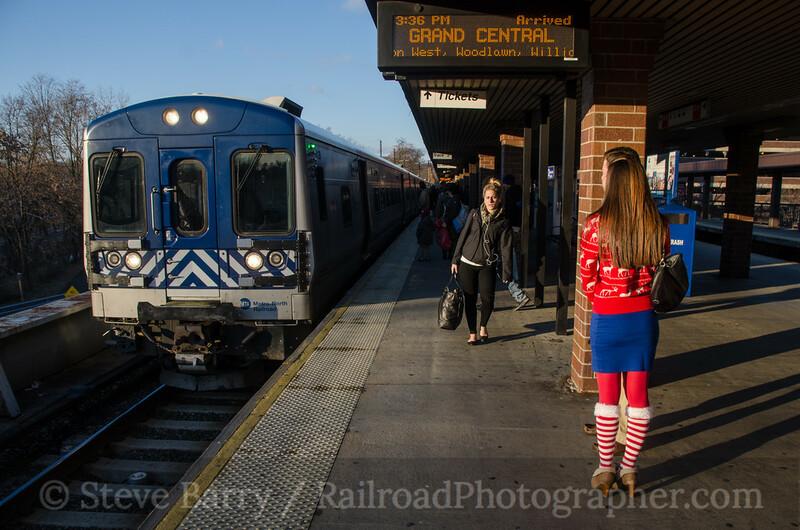 Despite the fact that this was a local train (which makes more stops and is much slower than the frequent express trains), the platform was fairly crowded with shoppers, sightseers and Santa's helpers heading in. Arriving at Grand Central with a few minutes to spare before the start pf the light show, I toured the holiday sales area in Vanderbilt Hall which seemed to be a very crowded mall with really tiny stores. Then it was off to the east balcony to set up for the light show, which would be projected in the windows on the west side (top photo in this entry). The half-hour show repeats continuously from 5:00 p.m. until 11:00 p.m., so once it was underway I took advantage of a behind-the-scenes tour that was offered by a friend. In each of the windows in the arch there is a scrim with a light bar below it. These are in the walkways that go across the archways at each end of the terminal. The third floor passageway is seen in the photo above. In all, there are 350 window panes in each of the archways. As the lights change colors, they can make designs, rough pictures and even letters. 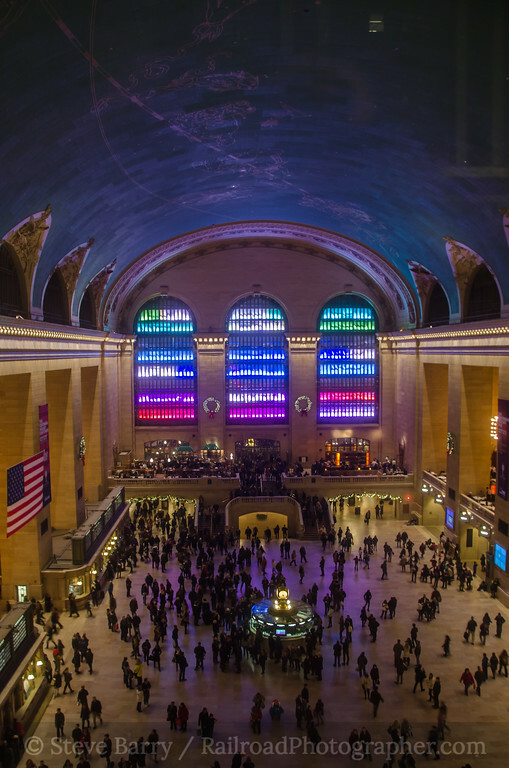 Heading to the east archway, I had the chance to look out from the third floor on that side of GCT at the light show across the main concourse. With its ceiling of constellations, towering arched roof and massive pillars, this is one of the grandest (and perhaps most famous) rooms in all of railroading. 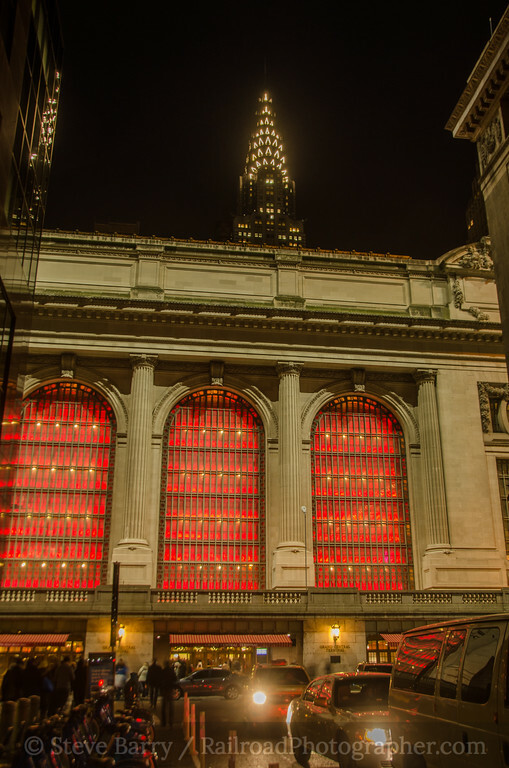 The light show is also visible from the outside of Grand Central along Vanderbilt Avenue. I set up a tripod on 43rd Street (tripods are not permitted in the building -- I used a railing to steady the camera for the lead photo in this story and a combination of low shutter speeds, high ISO's and a steady hand for the other interior shots) and captured the light show with the Chrysler Building overhead. 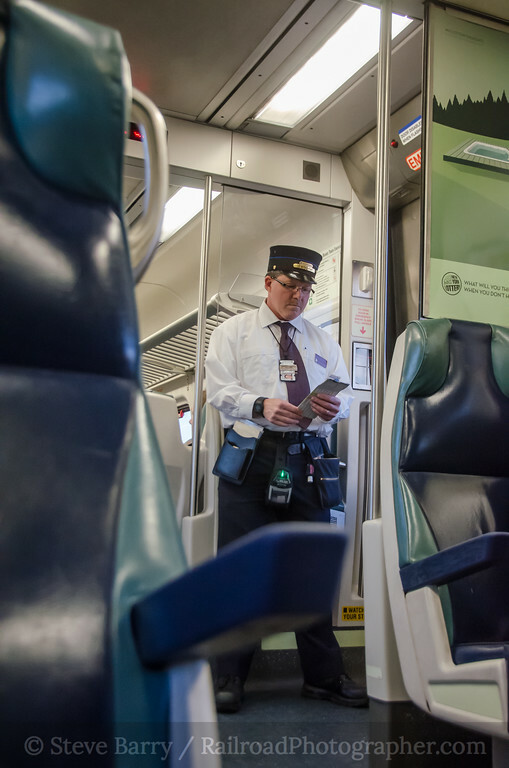 Finally, it was time to head back to White Plains. The light show, which is sponsored by Toshiba, runs through December 26. Naturally, once I got home and looked at the photos on my computer I noticed a lot of things I would do differently, so a return trip may be in order. Grand Central Terminal is always impressive -- you won't have to twist my arm very hard. For a more detailed look at the light show itself check out this story here.